2017 is going to be remembered as one of the best years in boxing history and it’s been a pleasure to witness. It’s incredible to think that it was over 6 months ago when I made the comparison with another great year 1997. 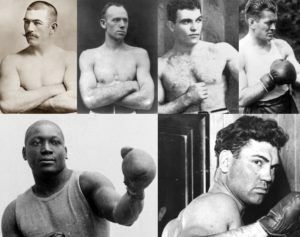 I sent my views into the Billy C show at the end of July and wrote an article ‘Magnificent 7 in 2017’ that highlighted the great fights we were being treated to. After picking out my best fights from both years here is my ‘round by round’ break down on how 2017 fared against 1997. James Degale against Badou Jack ended in a majority draw with the IBF & WBC super-middleweight titles on the line in one of the fights of the year. Leo Santa Cruz beat Carl Frampton in a rematch by majority decision to win back the WBA featherweight title. It may not have been as good as the first encounter but that was due to a change in style by Santa Cruz that left Frampton’s camp bewildered. Immanuwel Aleem beat Ukrainian Evhen Khytrov by TKO in round 6 to win the vacant WBC silver middleweight title. The second round saw 200 punches thrown; there are only 180 seconds in a round. Super featherweight Miguel Berchelt became the WBC champion when he defeated Francisco Vargas. The referee stopped the fight in the 11th round after a bloody Mexican war. In the WBC “Fight of the Year”, Daniel Zaragoza retained his super bantamweight title in an upset win against undefeated Irishman Wayne McCullough who had moved up in weight. Two undefeated super bantamweights fought it out for the vacant WBC title in Hull, England. Gavin McDonnell may have had home advantage but it was the Mexican Rey Vargas who took the belt by majority decision. In one of the shocks of the year American Rau’shee Warren lost a split decision against unknown Zhanat Zhakiyanov. The Kazakh who is trained by British fan favourite Ricky Hatton pulled off an upset and won the WBA bantamweight title. Lennox Lewis won the vacant WBC heavyweight title in a rematch against Oliver McCall. The referee stopped the fight after McCall refused to box and began crying in the ring. It was one of the strangest fights in boxing history that’s for sure. In the last fight of his career Mike McCallum lost a unanimous decision in a rubber match against James Toney. Keith Thurman defeated Danny Garcia by split decision to unify the WBC & WBA welterweight titles in an intriguing match-up. If ‘One time’ hadn’t stepped off the gas in the later rounds it would have been a unanimous decision. Tony Bellew moved up in weight to beat an injured David Haye in one of the most peculiar fights this year. It was definitely a bit WWE but not as much as another fight that happened in August which I will not mention. Gennady Golovkin retained his WBA, WBC & IBF middleweight straps in a close fight against Daniel Jacobs. Many people felt ‘The Miracle Man’ won the fight but for me Triple G did enough to get the nod. On the same bill Wisaksil Wangek became the first man to defeat Roman Gonzalez by a dubious majority decision. The four weight world champion was 46-0 before his loss but the Thai put an end to all doubters when he knocked out Chocolatito in the rematch later in the year. Jorge Linares was too strong in the rematch against a valiant competitor in Anthony Crolla when he retained the WBA and The Ring lightweight titles in Manchester. Before being voted into the International Hall of Fame in June 1997, a 40-year-old Sugar Ray Lennard returned to the ring for the last time against Puerto Rican Hector Camacho. Although both past their best at this point it was the younger man that came through victorious with a fifth round stoppage. Roy Jones Jr suffered his first loss at the hands of Montell Griffin who was also undefeated at the time. Although the six-time world champion was ahead on the scorecards Jones was disqualified for hitting Griffin while taking a knee in round 9. One of the greatest African boxers of his time Azumah Nelson lost to Genaro Hernandez by in a controversial split decision losing the WBC & Lineal super featherweight titles. The Ghanaian was almost disqualified when he punched the Mexican-American in the throat by accident. Anthony Joshua moved to 19-0 retaining his IBF and capturing the vacant IBO & WBA heavyweight titles when he stopped future Hall of Famer Wladimir Klitschko in round 11. It was Billy C Boxing’s fight of the year as well as mine. There is no question that the ‘Battle in the Capital’ was one for the ages. Take a bow gentleman. After his defeat to Keith Thurman in one of the fight s of 2016 Shawn Porter was pitted against Andre Berto in a final eliminator. In a scrappy but absorbing fight the former IBF champion earned another world title fight against the unified welterweight champ. Óscar De La Hoya was 23-0 when he took on WBC & Lineal welterweight champion Pernell Whitaker. Once again ‘Little Pea’ as Whitaker was known lost a dubious unanimous decision, although it wasn’t a blatant robbery like the Ramirez or Chavez fights. One of the greatest Mexican boxers of all time Marco Anthonio Barrera lost for the first time in 1996 to American Junior Jones by disqualification. Five months later and the Baby Faced Assassin lost again but this time by a controversial decision losing his a chance to recapture the WBO super bantamweight title. IBF welterweight champion Kell Brook defended his title against Errol Spence Jr at his beloved Bramall Lane, Sheffield after returning from a damaged eye socket he suffered at the hands of Triple G. Unfortunately for Brook he lost his title in front of a 27,000 strong crowd when the referee stopped the contest in the 11th round. It was later announced that ‘The Special One’ had damaged his other eye socket during the fight. After five successful defences of his IBF light-welterweight title undefeated Kostya Tszyu suffered his first professional loss against American Vince Phillips. Ring magazine named the fight as their upset of the year. After the very controversial first victory in favour of Andre Ward in November 2016 Sergey Kovalev promised to put the wrong right. Unfortunately for the heavy hitting Russian he was stopped in round 8 after a bitterly disappointing performance. What will be remembered is two of the best in the light heavyweight division fought again but the fight itself wasn’t much of a spectacle. WBA heavyweight champion Evander Holyfield defended his title against Mike Tyson after winning the strap in their first encounter back in November 1996. The rematch was eagerly anticipated but will always go down in the history books as “The Bite Fight”. Tyson was disqualified for biting off part Holyfield’s ear, known as the helix and spitting it onto the canvas. Eight-division world champion Manny Pacquiao defended his WBO welterweight title in Australia against home favourite Jeff Horn. It was a hard fought fight that once again ended in controversy after all three judges scored in favour of Horn. In a battle of the multiple division world champions Mikey Garcia produced a polished performance at the 140Ib catch weight against Adrien Broner. The undefeated American showed why he is one of the best ‘pound for pound’ fighters in the world right now and made Broner look mediocre at best. In his fifth defence of the IBF middleweight title Bernard Hopkins managed to stop undefeated Glenn Johnson in the 11th round who had an unblemished 32-0 record. The long-awaited unification bout between super-flyweight champions Danny Romero who held the IBF version and Johnny Tapia who had the WBO finally took place. In a close fight it was Tapia who came out victorious by UD. On a historic night in Lincoln, Nebraska Terrence Crawford fought Julius Indongo to determine the undisputed light welterweight champion, the first time all the titles had been at stake in a single fight since Bernard Hopkins vs Jermaine Taylor in 2005. 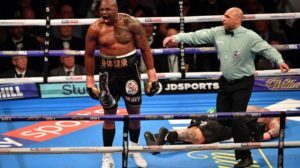 In front of his home crowd Crawford showed the world why he is considered one of the best ‘pound for pound’ fighters in the world when he knocked out Indongo in round 3. Five months on from his first professional defeat Roy Jones Jr was on a seek and destroy mission against Montell Griffin in the rematch. It took just over 2 minutes in the first round for Jones Jr to knock out Griffin and retain the WBC light heavyweight title. After years of marinating as we like to say on the Billy C Boxing show Saul ‘Canelo’ Alvarez and Gennady ‘Triple G’ Golovkin finally gave the boxing faithful what we all wanted. In a close fight which I feel Golovkin won by a couple of rounds the judges scored it a disappointing majority draw. Not quite the fight we all hoped for but a classic nether the less. At the ripe age of 39-years-old WBC super-bantamweight champion Daniel Zaragoza was knocked out in the 11th round by 21 year-old Erik Morales. This was the first World title in the legendary Mexicans glittering career. After both fighters recorded earlier victories in the year; Óscar De La Hoya as recent as June and Hector Camacho defeating a now retired Ray Lennard, it was time for a Mexico vs Puerto Rico tear up. Of course it was undefeated Mexican-American De La Hoya that retained his WBC and lineal welterweight titles with a UD victory. Ryan Burnett (my British fighter of the year) picked up the IBF bantamweight title in June with an accomplished performance over Lee Haskins. The Belfast boy wasted no time in becoming a unified champion when he defeated the WBA champion Zhanat Zhakiyanov. Both would have been forgiven for taking on an easier defence of their titles but this isn’t how these two roll. The late great Arturo Gatti made his first defence of his IBF Junior lightweight title against former champion Gabriel Ruelas. In typical Gatti style the fight had 5 fantastic rounds of boxing which ended with a beautiful left hook from Gatti that TKO’d Ruelas. Awarded ‘fight of the year’ and ’round of the year’ by Ring Magazine. With the WBO super-middleweight title vacant Joe Calzaghe, who was supposed to fight Steve Collins took on Chris Eubank. After the Welshman knocked Eubank down in the first round he went on to win by UD and pick up his first world title. Lennox Lewis retained his WBC heavyweight title for the second time in 1992 when he knocked out Polish number one contender Andrew Golota in the first round. The first encounter back in April was a contender for domestic fight of the year which ended controversially, but in the rematch Liam Smith produced a professional performance to beat Liam Williams by a majority decision. After the ‘Bite Fight’ incident earlier in the year Evander Holyfield avenged his defeat against Michael Moorer. After knocking down Moorer 5 times referee Mitch Halpern stopped the fight between the eighth and ninth rounds. Once again Holyfield unified the WBA and IBF heavyweight titles. At the age of 48, and his last professional fight George Foreman was given the opportunity to fight an ‘elimination bout’ against Shannon Briggs for the right to face WBC champion Lennox Lewis. Unfortunately the heavyweight legend lost a controversial majority decision against his younger opponent. Vasyl Lomachenko or ‘No Mas Chenko’ produced another quality performance against Guillermo Rigondeaux who moved up two weights to fight Loma. This was the fourth time in a row that the Ukrainian forced one of his opponents to quit, as Riga retired on his stool after round 6. Not too many pundits or boxing fans gave WBO middleweight champion Billy Joe Saunders a chance against the heavy hitting Canadian David Lemieux. The Brit won by a landslide with a superb performance on Lemieux’s home patch. In one of the fights of the year domestically Conor Benn was dropped twice in the first round by Cedrick Paynaud. Benn responded well and managed to knockdown the Frenchman in rounds 5 and 6, to win by the referee’s scorecard. With back to back victories against Barrera, Junior Jones defended his WBO super bantamweight title against 1988 Olympic gold medallist Kennedy McKinney. Jones lost his title by TKO in the fourth round. In what is my fight of 1992, Naseem Hamed finally made his US debut against former champion Kevin Kelley. The flamboyant Hamed was put down three times but managed to comeback strongly and win by knockout in round 4 and retain his WBO featherweight title. So there you have it a draw! The 2017 crop flew into a four round lead after the first six rounds but 1997 came back strong with some excellent fights at the back end of the year. Not all were spectacular but what we did see last year was the best fighting the best so let’s hope that 2018 can be even better but it will take some doing. 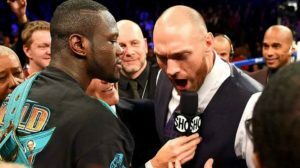 Fury-Wilder but what’s Big Josh got to do with it?